Beschreibung: Healthy Food Eating. 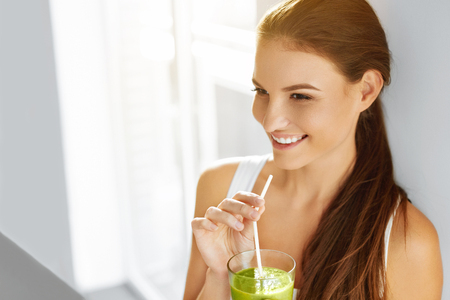 Happy Beautiful Smiling Woman Drinking Green Detox Vegetable Smoothie. Diet. Healthy Lifestyle, Vegetarian Meal. Drink Juice. Health Care And Beauty Concept.